One of my all time favourites. Couldn't get a decent original but this remaster didn't disappoint. It is sumptuous. I have a couple of originals but am happy to complete my AC/DC collection with these remasters. I have an original Australian pressing on the Albert label and compared to this reissue I prefer the old version. The new pressing is quiet and flat but just lacks the punch of the original issue. If you have nothing to compare this to then I think you would be satisfied with the sound. It is not over brightened like many reissues that have been digitally fiddled with and compression is not too bad. But for my money the original has more grunt when cranked. use your cd for a drink coaster. Great album, so great, i and probably everyone else has listened ad nauseam (fm radio, cd, mp3.). but alas, this vinyl version breathes new life into a tired old friend. it's not dead quiet, but it doesn't need to be. I purchased this album awhile ago. Just now reviewing it. This pressing is great. It was mastered by the late george marino at sterling sound from the original analog source. George did great work on this album. The best I have ever heard AC/DC sound. You won't be sorry you purchased this one. A must have for any fan of ROCK. Just as I remember them way back in the 80's when this album was released. This LP sounds great on my system - I crank it right up - all good! 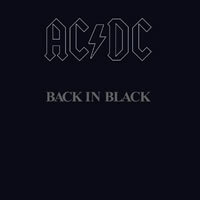 Back in Black, in my opinion, is the quintessential AC/DC album. Every tune is top notch, offering the listener catchy riff work, straight ahead boom-boom and some great lyric work. With Hell's Bells as the anthem piece, the rest of the LP follows in stride and keeps the listener on his toes time after time. The heavy vinyl release surely usurps the CD, and this is a must-have LP for any rock-n-roller with an audiophile bent.